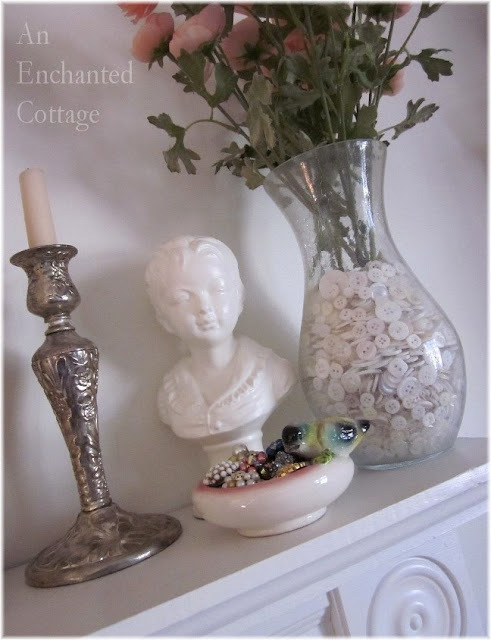 An Enchanted Cottage: Button, button, who's got the button? 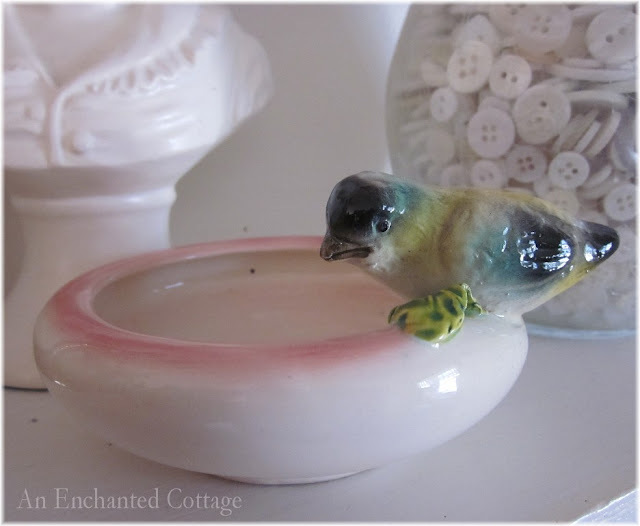 ... and they're all being watched over by this beautiful little bird, perched on the rim of this petite bowl. Isn't he handsome? But a little birdie told me (yes, it was him) that he prefers to be the main pop of color, and I quite agree. This beautiful bird bowl was sent to me last year by a very good friend who wanted to cheer me up. She knew I was having a hard time dealing with my dad's passing and, being the generous, caring person that she is, she sent this little beauty my way to bring a smile to my lips. You might remember that Claudia also posted about PicMonkey last week. Let's just say I'm officially addicted to PicMonkey now. See the photo above? Look at it after playing with PicMonkey!! OMG, I am absolutely in love with this site! You must go check it out! It's like eating potato chips. One just doesn't satisfy you. So I "tweaked" another! Isn't this just too cool?? I hope you all have as much fun as I do visiting PicMonkey! And Claudia, once again, thank you for my beautiful bird bowl! I absolutely love it! I'm linking up to Show & Tell Friday at My Romantic Home. Be sure to pop over and visit everyone! That little birdie is so pretty! And thanks for the PicMonkey link! I love collecting bouttons, too! They are useful in crafts and gorgeous in displays like yours! 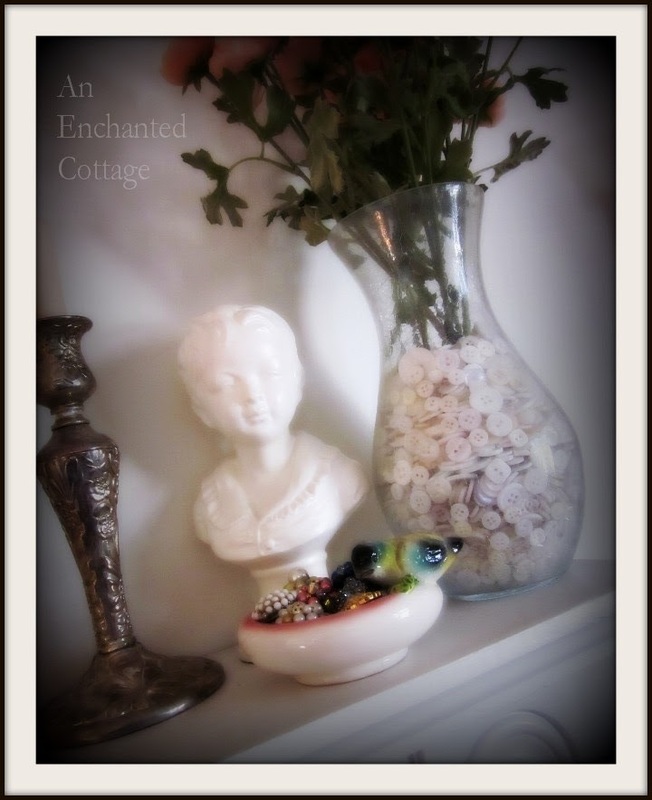 I'm going to have to try Picmonkey, it's fabulous! OMG- My dear Aunt Phyllis taught us many years ago how to play Button, Button - I had completely forgotten all about that till I read your sweet blog post. LOVE the bird bowl. I kinda have a big thing for birds. Ask my DH who is always the one filling the 7 bird feeders we have! That's why our home is named Finch Rest!!! I loved those changes to your pictures - I have always been afraid to try, may have to play with that program soon. Love your vignette. 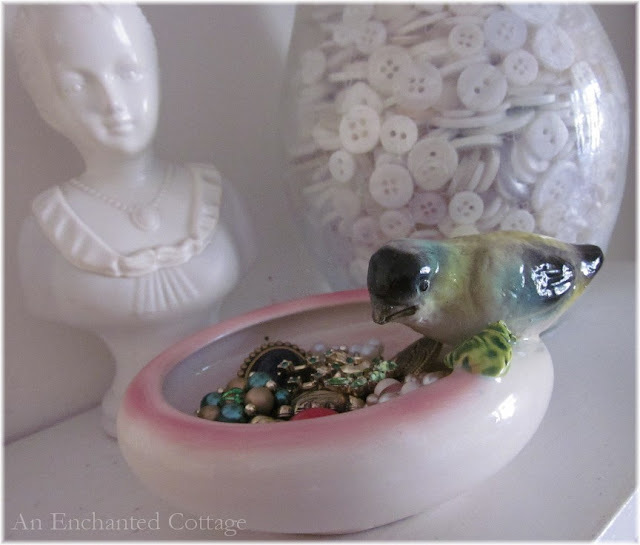 The little bird is so cute perched on the bowl! Love all your buttons and earrings too! I enjoyed your post very much! Your gifted bird dish is beautiful..and so special since the gift came from a dear friend who was thinking of you and wanting to cheer you up..a very dear friend indeed! I love your PicMonkey edits! They look dreamy. I'm so glad you like the birdie bowl. It just shouted out your name to me. I can't imagine a more perfect home for it. Enjoy, my friend.